We instructed Enterprise Plumbing to install a new kitchen, Lee visited on a numerous occations with advice and suggestions we would never of thought of. We had several quotations from various companies, but Enterprise was the most reasonable and knowing his work as prevously as installed our bathroom and cloakroom. He has completed a lovely kitchen one that will last for a very long time. My husband and i are very happy with Lee's work. 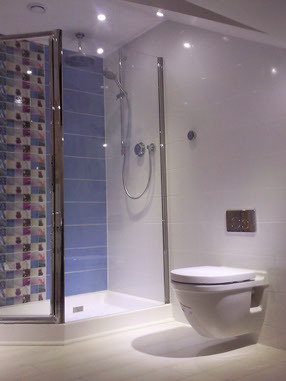 We employed Enterprise Plumbing to provide and install and en-suite, bathroom and refurbish our kitchen. The service was friendly, professional and dedication in getting the job done to the customers requirements, on a budget and for many, most importanly, on time. Thanks for a good job we're really please with the tranformation. Jast to say "Thank you" for the bathroom makeover! We have waited for ages for our new bathroom and we are so thrilled with the job you've done. Thanks for helping us out with our decisions and for your professionalism. We will definitly recommend you to friends and family. We have no hesitation in recommending Enterprise Plumbing - 2 Bathrooms and a down stairs cloakroom have been removed and replaced retiled over the last three years on every occasion the work was undertaken and completed in time to a very high standard. Thank you.